Good luck all ! Thanks for this ! Now it's all good. Looks like the problems was from the fact that the server was overload. Hello everyone. 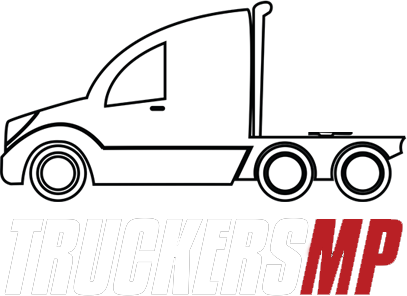 Since I got permanent ban I would like to have my truckersmp account removed from the website. How can I do that ? I was thinking to try at truckersmp feedback email but I always got back that the email could not be sent to that email address. Thank you ! Yeah because 90% are reckless kids that love to ram people. Mod Version: Version 0.2.1.7.0 Controllers Used: Keyboard and joystick Description of Issue: After the last update looks like the old problem is back. The truck is steering to right when you don't expect and sometimes it drives itself backwards. How to reproduce: Just normal driving Screenshots / Videos: None. I tried all the things to fix it but works just for some time. New profile, no mods, no cheat but still crashes very often no matter where I am. Cars are cool when you're bored to try to deliver trailers and get rammed by others with cars :)) . But a truck with pilot paint was better and good looking ! I hope will be so easy to fix it. Hope so, it's very frustrating to try do downgrade and get the same version of the game. i tried and beta 1.27 but without success. Last time took a few days to update truckersmp. Weird is that I can't downgrade the game. I get the same thing and the option before to go in betas and add temporary 1.27 doens't work now. I see no new cargos in the game with the new update. Max cargos of 25 tons.